A perfectly coordinated set of 3 horizontal 5x7 fine art photographs in shades of teal, turquoise, aqua, blue and black. 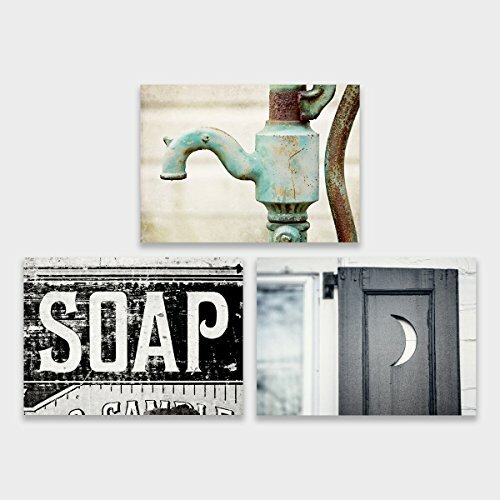 Perfect for your farmhouse or rustic bathroom or powder room. Your unframed prints are created using premium, archival fine art paper with a soft luster finish. In a standard 5x7 size, they're easy to pop into off-the-shelf frames. Your prints are signed & dated (on the back), then placed in a waterproof glassine envelope with backing board, which is then placed in a white flat bag with notecard. Finally, the finished package is placed inside a white sturdy envelope. A lovely presentation that ensures safe delivery and is perfect for gift-giving!